Asking questions is not only a normal part of the discernment and formation process, but we strongly encourage it! Below you will find the answers to some of the most frequently asked questions women ask when they’re discovering their vocation. As always, you are welcome to contact us with any additional questions you may have. How do I know that I have a vocation? What are the different works of the congregation? How can I tell my family and friends that I think God is calling me to be a sister? When and where does a person make first vows? Where will I be living during formation? What books can I read to help me with the discernment process? Does the idea of becoming a sister keep coming back time and again even though you thought you had moved on in your life and forgotten about it? Does the idea of becoming a religious sister excite you and at the same time frighten you? In keeping with the charism of our foundress, Clelia Merloni, our congregation serves the people of God in ministries of loving service: education, healthcare, social/pastoral service, and missionary activity. Be open and honest about your life’s journey. Show your family and friends the life-giving aspects of the lifestyle you are discerning. Invite them to come with you to meet the sisters. For the Apostles of the Sacred Heart of Jesus, a young woman (between ages 18-35), after participation in discernment events, reflection with a spiritual director, and dialogue with the vocation director, may request application for the Pre-Postulate Program. Visit our Formation page for more information. The Pre-Postulancy is for two weeks. Initial formation includes Postulancy (2 years), Novitiate (2 years), and a period of temporary vows (5 to 9 years). After the novitiate, a woman makes first vows at the Motherhouse of the U.S. Province. 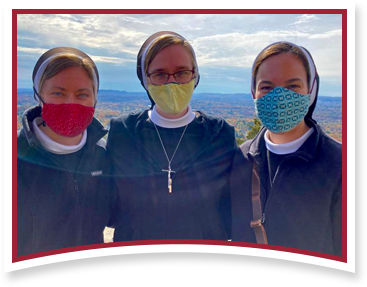 During the Pre-Postulate, Postulate, and Novitiate, the candidate will live on the property of the Motherhouse of the U. S. Province in Hamden, Connecticut. Ministry experiences may take place in other houses of the Province. We recommend reading Scripture and Lives of the Saints. Recommendations from your spiritual mentor are also good resources. For further recommendations, please contact our vocation director. Apostles of the Sacred Heart of Jesus begin their day as a community with prayer (Morning Prayer, the Liturgy of the Hours, meditation, and Eucharist). Sisters spend time in ministry throughout the day and gather in the evening for community prayer (Liturgy of the Hours, meditation, and rosary). After dinner and community time, the sisters end the day with night prayers. Prayer, community, and ministry from our day, in following with the advice from our foundress, Blessed Clelia Merloni: “Look for Christ’s presence in your everyday life, seeing His powerful, yet gentle hand guiding your every action." Are you interested in the Acts of the Apostles Service Program? Please visit our Acts of the Apostles page to learn more.